Your DAC came with a basic setup guide and manual, but we regularly hear from owners with uncertainty. So we decided to sit down and play “Will it connect?” with some of our gear and share practical examples. For help connecting a DAC to your phone or tablet, please see How to Connect Android, iPad, or iPhone to a DAC. Everyone loves the convenience of powered speakers, and JDS Labs customers often want to make full use of their DACs with their headphone and speaker systems. Below are the most common connections. RCA cables are definitely the easiest way to connect most DACs to a set of powered speakers. Simply run an RCA cable from your DAC’s RCA outputs to the RCA inputs of your speakers. Make sure everything is powered on and you’re good to go! If your DAC and speakers use 3.5mm jacks, simply use an auxiliary cord. To connect a 3.5mm jack to RCA jacks, use a 3.5mm to RCA adapter cable. While measurable crosstalk performance is best via RCA cabling, there is no audible penalty by using an adapter. The Audioengine A2+ speakers pictured above provide several inputs, including 3.5mm, RCA, and even their own integrated USB DAC. It’s generally best to use RCA cables to connect a DAC. Please refer to your speakers’ manual for more help. If your desktop audio system includes a JDS Labs Element or EL Amp, you can seamlessly transition between your powered speakers and headphones. Plug in your speakers via RCA and headphones via front-mounted ¼” jack, then press the power button to toggle between your speakers and cans. 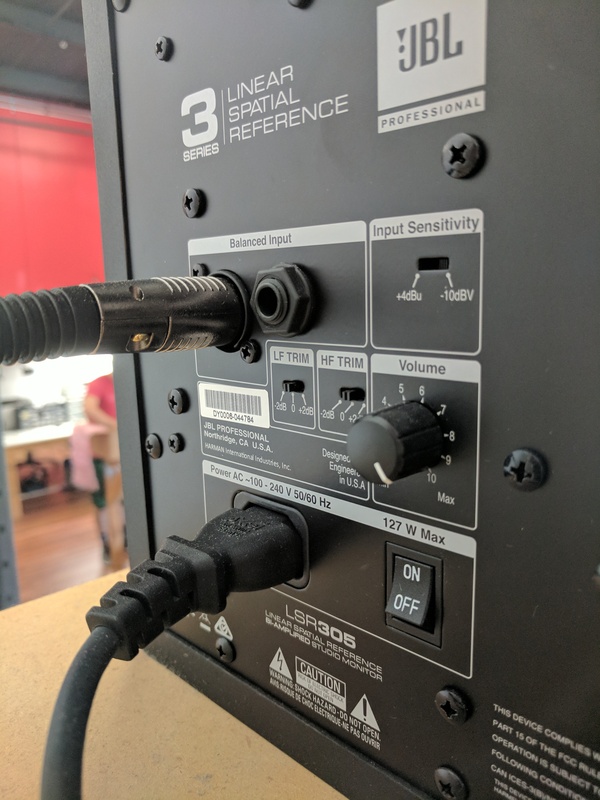 For other headphone amps and DACs, you can manually unplug your DAC and reconnect to speakers as needed, or use an OL Switcher to transition between setups with a switch. Balanced speaker inputs, either XLR or TRS, can be connected to an unbalanced (single-ended) DAC. To connect a DAC with RCA outputs to a balanced XLR input, such as JBL LSR305‘s, simply use two XLR to RCA cables (one cable per speaker). That’s it! TRS jacks, also referred to as ¼” inputs, are trickier. In a balanced system, the pinout may or may not be known. The positive (non-inverting) and negative (non-inverting) balanced signals may be opposite in some systems, so only make use of TRS inputs if you can determine the exact pinout. Once you have determined your speaker input pinout, use a ¼” TRS to RCA splitter paired with RCA cables to access only the positive portion of the balanced signal. Here’s the trick: Ignore the colors at the TRS splitter! You must connect the positive signal of your Left speaker to the Left RCA jack of your DAC, and connect the positive signal of your Right speaker to the Right RCA jack of your DAC. This means you’ll have either two reds, or two whites connecting to the DAC. Ignore the inverting signal. In other words, you will be left with one unused connector at the splitter of each speaker. It’s messy. For this reason, we recommend using XLR to RCA cables if at all possible. Make sure you’ve selected Optical Output and Uncompressed Stereo and enjoy! Make sure you’ve selected Digital Out (Optical) and set the audio format to Linear PCM. The PS4 is a little finicky and will also output audio via HDMI even after all of these steps. After scouring the internet and troubleshooting in the office, the best solution for this is muting the device outputting audio via HDMI. PS4 is also known to limit output volume. If you plan to listen to your DAC with a PS4, please tell us when placing your order. We can force your DAC’s firmware to require PS4 to set 100% output volume. Feel free to reply below or email us with any questions! Thank you very much for this information it was extremely helpful!! Thanks for your answer John. So, volume control is not inline with the rear outputs also? Can I use both the el DAC and el amp together with Xbox one?